Bosch coffee maker 2 secret weapons to making great coffee! Is this bosch coffee maker the new tassimo that we are talking about? No. 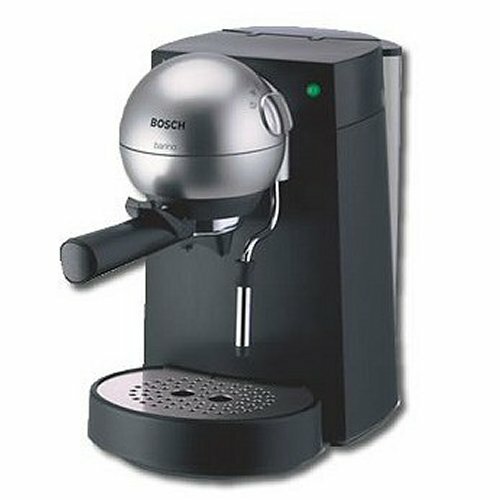 Sure, there is alot of buzz going around for the September 08 launch of the new tassimo, but no, this is another great bosch espresso maker. We are talking about the barino bosch coffee maker and 2 of its features that make it such a good buy, in fact value for money for their mid range pricing. Before moving on to these 2 features, this coffee maker has what I consider important for home consumption -ease of use. This coffee maker (oops, to be politically correct, it is actually an espresso maker, but anyway...), has a multifunction control knob that allows you to switch from brewing, to hot water, and even to the various steaming functions. A very simple way to make espresso and the many gourmet coffees. Still talking about the ease of use, I loves the way this bosch barino stainless steel wand make it so easy to make the various gourmet coffee. For one, it is extremely easy to get the perfect cappuccino foam with the frothing tip, while I want to believe that it is my brewing skill improving, I know for a fact that there are some deep "R&D" stuff that goes behind this steaming wand. Reading here, what are the 2 secrets from this bosch coffee maker that gives us great coffee? Well, the first and most important to any espresso maker is the pressure. Anything below 12 bar would not get you the full extraction of the coffee ground. So, with a powerful 15 bar of pressure from its vibratory pump, this is in fact the same pressure found on some commercial models, you can be assured of the maximum flavor from your choice of coffee beans. Bosch barino most important feature is the powerful pressure that it is able to attain, however, it is the second feature that compliment this feature to deliver the good coffee. Have you ever tamp a coffee bed before? If yes, you would know how difficult to get great espresso using this method and that is the reason skilled baristas are highly paid. Tamping the coffee into the correct tightness would make a big difference in the finished brew. And bosch barino pressurized coffee filter system does away with that problem by pressurizing the brewing chamber. This automatically improves the extraction from the coffee grounds, proving the prefect brewing condition. Sure, this bosch coffee maker is not as easy to use as a single serve coffee maker, but with just a knob and no worries about the tamping of coffee bed, it is probably second only to single serve coffee maker if you are looking for easy and good coffee.